North Shore surf competitions are some of the most exciting sporting events in the world. That’s not an opinion. Ask anyone who’s been to one—they’re incredible. Whether you’re an avid surfer or have never touched a surfboard, surf competitions on the North Shore of Oahu, Hawaii, are an amazing sight to see. Locals and visitors alike gather on the beach to watch the best surfers in the world pull into 20-foot barreling waves at the legendary Banzai Pipeline. The crowd holds their breath in unison, waiting to see if the surfer is going to make it out the other side, and cheers erupt as the pro spits out of the wave unscathed. There are lots of things to do on the North Shore, but if you find yourself in the area during wintertime, do yourself a favor and go see a North Shore surf competition. 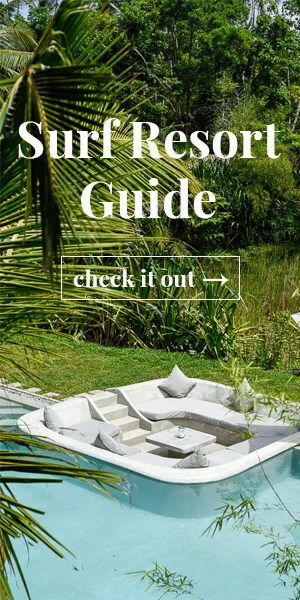 And check out our Guide to North Shore Oahu for our recommendations on the best restaurants, shops, and things to do on the North Shore. In the winter months between November and March, huge swells bless the North Shore of Oahu with some of the best waves in the world. Said waves attract the best surfers in the world and serve as a stage for a few of the most exciting surf competitions in existence. Surf competitions work a bit differently than your typical sporting event because organizers are at the mercy of the waves, so below we explain how surf competitions work. And below that, we’ve compiled a list of the top surf competitions on the North Shore and all the dates and details for the 2018 – 2019 winter season. In case you’re not familiar with the format of surf contests, here’s the lowdown. Since coordinators can’t predict what exact dates will have the best conditions for surf, there are date windows in which any given contest will take place. For example, the window for the Pipeline Masters in 2017 was December 8 – 20. During the competition window the weather and wave conditions are closely monitored, and every morning the contest officials make the call whether the contest is on or off. If you’re visiting Oahu in a contest window, check out the website of the contest host or their social media every morning to see if the contest is on. Or just check out the World Surf League website, as they host most of the top contests listed below and provide live updates on whether they are a go or not. Take binoculars. You’ll be stoked to have them for places like Sunset Beach where the action is a few hundred yards offshore. Pack snacks for the day. Most competition sites have minimal food available if at all. Take your own shade. In the morning there can be some shade, but it’s very limited in most cases and the sun can still be plenty hot in Hawaiian winter. If you bring an umbrella or other shade-giving contraption, do everyone a favor and keep it low or set up to the side. Bring a camera (with a telephoto lens if you have it). It won’t do the waves justice, but you’ll have fun trying. 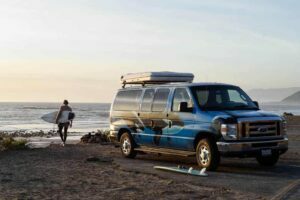 The Vans Triple Crown of Surfing (#VTCS) is one of the most sought-after surf competition titles in the world for a professional surfer, especially a local North Shore Hawaiian surfer since the entire series of events take place on their home turf. 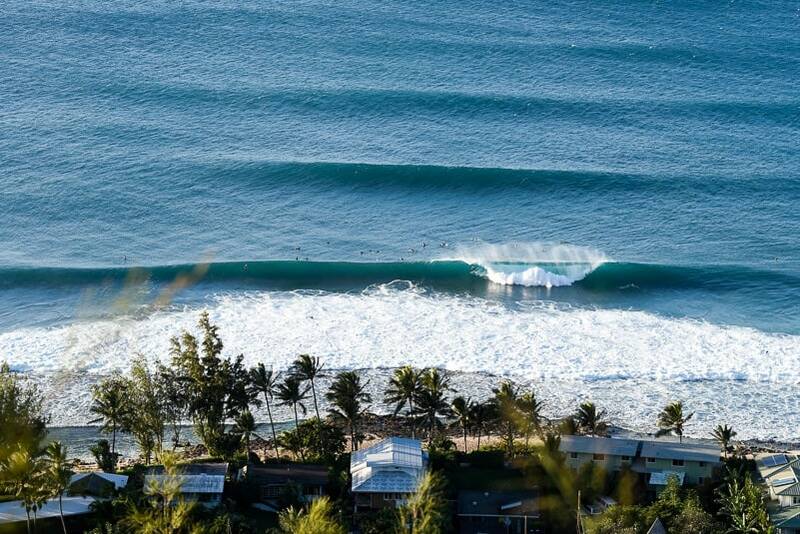 The VTCS is actually a combination of four events. The four events are the HIC PRO at Sunset Beach (a qualifying event), The Hawaiian Pro at Hale’iwa, The Vans World Cup of Surfing at Sunset Beach, and the Billabong Pipe Masters at the infamous Banzai Pipeline. WHAT: A series of 4 different events. 1 qualifying contest and 3 main contests. GOOD TO KNOW: The four contests take place over the course of seven weeks or so. Each event has its own window of opportunity to run (outlined below) and a single event will take three to four days to complete. The event coordinators do their best to choose the highest quality surf conditions within any given contest window. The winner of the Vans Triple Crown of Surfing is crowned champion after all event points are tallied up at the Billabong Pipe Masters. Since the early 80s, the HIC Pro has been a platform for locals and surfers from around the globe to show off their skills and qualify for entry into the Vans Triple Crown of Surfing. Over 100 professional surfers compete for a spot in the world-renowned surf competition and it’s always an epic showdown of wave riding talent not to be missed. GOOD TO KNOW: Since the HIC Pro is a qualifying event as opposed to one of the main events, the competition typically draws fewer crowds. There are a couple of food trucks in the area, including the Insta-famous Sunrise Shack coffee stand on Kam Hwy where you can get your fix of bullet coffee, tea, and papaya bowls. 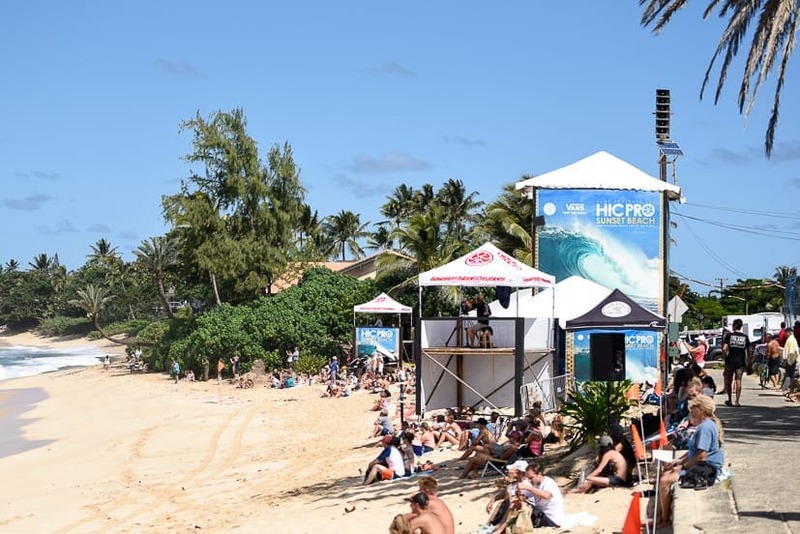 The Hawaiian Pro is officially the first event of the Vans Triple Crown and is hosted at Ali’i Beach Park to the west of the boat harbor in Haleʻiwa. Haleʻiwa is a surf break with many faces. From punchy waves when it’s under head high to gnarly barrels and closeout bombs when it’s double overhead plus, Haleʻiwa is a training ground for many up-and-coming Hawaiian surfers. Unlike Sunset Beach where big open face carves and power surfing are suited and often favored, The Hawaiian Pro at Haleʻiwa is the ultimate high-performance surfing arena. If it’s going off at Hale’iwa you can count on witnessing some unreal turns, epic barrels, and an array of ariel maneuvers. GOOD TO KNOW: Parking can be tricky and expensive if you get a ticket. If you’re parking on the main street make sure that your car is completely off the road and not obstructing any walkways. We’ve seen the parking police give multiple tickets for vehicles that were barely crossing the lines. Food isn’t readily available in the immediate area so pack a lunch if you plan to stay a while. For the second competition of the Vans Triple Crown of Surfing, the crew heads back to Sunset Beach for the Vans World Cup of Surfing. But by this event, all the pros are well warmed up from the previous two events and extra fired up to finish their last two events strong which makes for some exciting heats. The stakes are higher this time around so the crowds will typically reflect that. The lineup at Sunset Beach is a massive playing field. The waves can get ginormous and the conditions can be treacherous and unruly. Surfing Sunset Beach is the ultimate proving grounds as there are a variety of conditions to endure— with multiple peaks to navigate and a whole lot of water moving. The waves tend to be big, powerful, and just downright nasty at times, which is all part of the beauty and amazement of Sunset Beach. You’ll watch in awe as the pros throw down freakish open face carves and pull into dredging barrels. 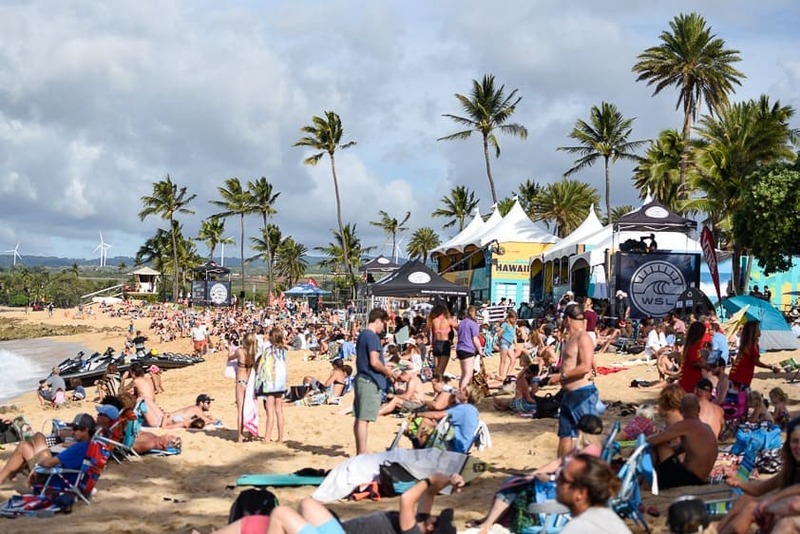 If it’s on and the waves are pumping, the Vans World Cup at Sunset Beach on the North Shore of Oahu is a surf competition that you’ll never forget. GOOD TO KNOW: There are a couple of food trucks in the area, including the Insta-famous Sunrise Shack coffee stand where you can get your fix of bullet coffee, tea, and papaya bowls. The third and final stop of the Vans Triple Crown is the world-famous Banzai Pipeline. This event doubles as the final event of the World Surf League (WSL) Championship Tour as well. Banzai Pipeline is world famous for a lot of reasons, but especially its size, shape, power, perfection, proximity to shore, and its mesmerizing beauty. The break is capable of producing 25-30 feet gaping barrels that explode onto super shallow and craggy coral reef. This all goes down very close to shore making the beach at Pipe the ultimate wave watching platform. GOOD TO KNOW: Banzai Pipeline breaks left. However, pros often surf the right which is known as Backdoor. Depending on which direction is barreling better, the best seats in the house are either slightly up the beach northeast of the main peak if Pipe is doing its thing, or slightly down the beach southwest of the main peak if Backdoor is working instead. If you get hungry you can grab a delicious acai bowl at Crispy Grindz which is only a short walk from Pipe on Kam Hwy directly up the beach access point at Off-the-Wall. ‘The Eddie’ is a big wave invitational surf contest named after Eddie Aikau. Eddie is a legendary North Shore lifeguard and surfer who was known to chase the biggest swells and charge the biggest waves. A well-known saying in the surf community is “Eddie would go” which refers to how the fearless waterman would commit to paddling into the biggest and gnarliest waves. This big wave North Shore surf competition has been around for 33 years but has only run a total of nine times since 1984 because the waves need to be huge for the contest to run. The contest has around a three-month window from December through February when everyone involved is keeping a close eye on the surf report in hopes of identifying a swell worthy of running the contest. They look for swells that will produce waves in the 30-40 feet range. Last time it ran in 2016-2017, defending world champion and North Shore local John John Florence won the prestigious trophy. The Eddie did not run in 2017-2018 after a break in ties between the Aikau family and Quiksilver (the event’s normal main sponsor), and there was much speculation about if the event would run in 2018-2019. We’re excited to confirm that the event has secured new sponsors and is ON for the 2018-2019 winter season. The Eddie will run if surf heights reach a consistent 20 feet between December 1, 2018, and February 28, 2019. The opening ceremony to kick-off the waiting period will be held Thursday, November 29 at 2:00 pm. GOOD TO KNOW: This event is a big deal with a lot of history surrounding it. It has only been given the green light to run eight times in the last 33 years! If you’re lucky enough to be in Oahu when this contest is a go, this is a surf competition that you don’t want to miss. Waimea Bay is the ultimate North Shore surf competition amphitheater with viewpoints surrounding the action. Bring binoculars, pack a lunch, and enjoy the show. While this isn’t a Championship Tour event, you’ll still find many of the world’s best and the majority of the top 34 pros taking advantage of the opportunity to surf perfect Pipeline with only a few other surfers in the lineup. You can expect all the same excitement and showmanship as you will find at the other Banzai Pipeline events. There are just a bit less hype and fewer crowds since it’s the beginning of a fresh new season of professional surfing. GOOD TO KNOW: January is a great time to visit the North Shore of Oahu. After the holiday season, there’s still plenty of pros and surfers around but general tourism tends to slow down a bit so it’s somewhat less crowded than December. Da Hui Backdoor Shootout and Da Hui Pipeline Warriors are invitation-only North Shore surf competitions that feature some of the best Hawai’i Pipe surfers and watermen on the planet, featuring not only shortboards but also longboards, bodyboards, and body surfing. The Da Hui Backdoor Shootout is a unique jersey-free event held in memory of Duke Kahanamoku. Teams of 4 come together to compete against each other in this unconventional and epic event. The Da Hui Pipeline Warriors event is similarly jersey-free and includes various board riding divisions, but in this event, it’s every man for themselves. The events are put on by the Da Hui family and various sponsors. Da Hui Backdoor Shootout: January 4 – 16, 2019. Da Hui Pipeline Warriors is typically held in early February but we don’t have confirmed dates yet. We’ll update event dates once confirmed. GOOD TO KNOW: The contests will be held on the best 3 – 4 days of surf conditions. You can watch it live on Surfline and Spectrum Hawai’i Surf Channel 250 or HD 1250. 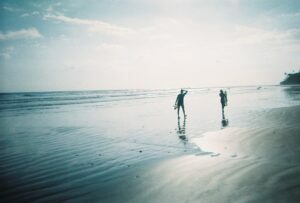 They have different divisions including bodysurfing, SUP, Longboarding and Team Surfing. The Sunset Open isn’t part of the Championship Tour, but an event in the Men’s Qualifying Series, also known as a QS event (the division that pro surfers have to compete on to ultimately make it to the WSL Championship Tour). While this contest doesn’t include the most famous surfers, it certainly still features some of the very best surfers in the world competing at Sunset Beach. The Sunset Pro Junior features men and women competing on the Men’s and Women’s Regional Junior Qualifying Series. The Junior Qualifying Series is a WSL division featuring top surfers 18 years old and under. These surfers may be young, but they are incredibly talented and definitely worth watching at Sunset Beach. GOOD TO KNOW: The break is a bit far away from the beach so binoculars come in handy. Have we missed any top North Shore surf competitions for the 2018 – 2019 winter season? If so, please share the stoke and fill everyone in with a comment below! Mahalo! Hey guys! Thanks for all the info. My partner and I will be in hawaii from 21st jan to 31st of jan.
How would we be able to know when the Eddie Big Wave international would be on? Where would you recommend to go if we want to catch some surf action if there are no events? Thank you! We will be on the island from januray 28 – Feb 8. I see that you have posted the Volcom Pipe Pro 2019. Is there a specific time and place for the competition? Hi Sue-Ann- Yes, the Volcom Pipe Pro will definitely run during your stay! The event will run at Pipeline on the North Shore. See the beginning of this post for details on how surf competitions work, but in a nutshell, during the competition window the weather and wave conditions are closely monitored, and every morning the contest officials make the call whether the contest is on or off. So during your stay, check out the WSL’s 2019 Volcom Pipe Pro page to see if the contest will be running that particular day. Have a great trip! My family and I will be vacation on the island Feb 13 thru 19. Any chance we might see something during that time? Hi Crystal, it’s possible that ‘The Eddie’ Aikau Big Wave Invitational could run during that time, there has been lots of big wave activity this winter but ‘The Eddie’ will on run if it’s a massive swell with lots of potential. However, if it doesn’t go when you’re out there you should definitely still go stop by Pipeline, Sunset Beach, and Waimea Bay to check out the local surf scene. There will likely be some amazing waves to see and only the best surfers are out if it’s big. Not to mention, the beaches are very beautiful too. Any word when the Buffalo Big Board Surfing Classic will be held in 2019? I know it is usually the last 2 weeks of February, has it been actually scheduled yet? Hi Jeff- We’ve done some digging but haven’t yet found any confirmed dates for the Buffalo Big Board Surfing Classic. We’ll keep on the lookout and update you here if we find out confirmed dates! Hey guys…love all the info you provide about the different competitions. Bringing my family from Texas 12/30 thru 1/6 and hoping to catch a competition. I saw on another site that the DaHui was set for 1/4 – 1/15…can you confirm that? Also, about how much notice is given for the Eddie Big Wave? Just wondering if it´s more of a waves look great next week so let´s do it, or is it the waves are awesome today so let´s go. Would love to bring some country folk to see some surf action! Hi Ryan, happy to help! We just found out that the holding period for the Da Hui Backdoor Shootout is 1/4 – 1/16, 2019. So if you’re lucky and there’s a good swell during your trip, the contest might run while you’re there. For the Eddie, it really depends on conditions… organizers are always watching the upcoming weather and swells, so sometimes there will be talk of the contest a week or so in advance. Depending on the confidence of the conditions, organizers typically will confirm the contest a day or so before they green light the contest day. Hope you have a great trip and get to watch some amazing surfing! Cheers! My family and I would love to see a professional surfer competiion!! We will be in Oahu from january 3rd to january 10th. Do you know if there is a special event during these dates? My kids would be so impress to assist to real competition. Thanks for giving me informatins! Will be visiting Dec 20-26, and it seems the only possible event to catch is Eddie’ big wave invitational, and it is not clear when and where to catch them. 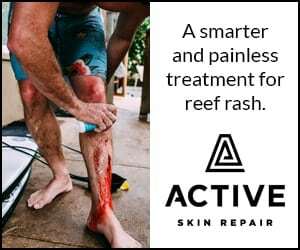 Can you comment on this, or any other events or best place and time to catch big wave surfing? (Or, anything else highly recommended) THANKS SO MUCH!! Hi John- Looks like the only potential event that could happen during your trip is the Eddie and since this event will only run in very specific conditions, there’s no way to know if it will run during your trip. To see if the Eddie will run, check Surfline during your trip. If the contest runs it will be announced there. For more info on Oahu and the best things to do, check out our Oahu Travel Guide! Have a great trip! 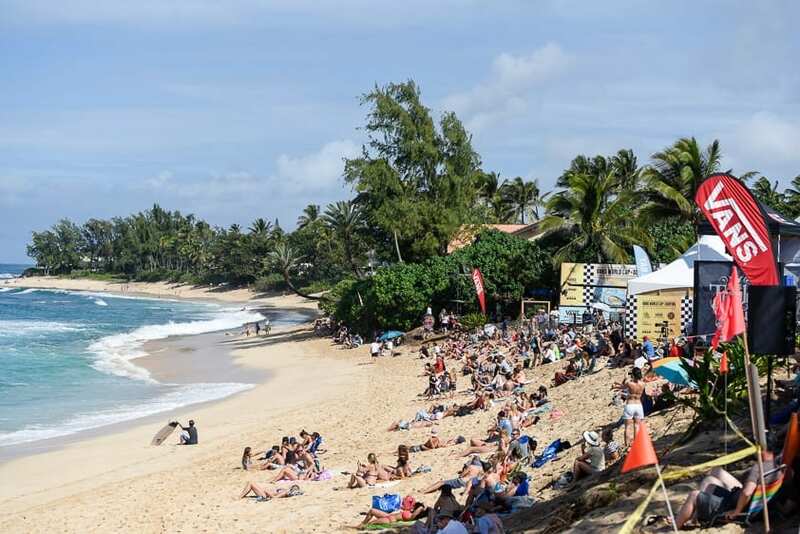 Is the The 2019 Volcom Pipe Pro postponed? I have read, that 2019 is no competition? What is about Da Hui Backdoor Shootout & Da Hui Pipeline Warriors 2019, will be possible to see? Good morning! Have there been any updates on The Eddie for the 2018/2019 season? Will be in town for the weekend when opening ceremonies are usually held and hoping it’s a go! Thank you. Hi Jackie! I wish we could be more help, but there hasn’t been much info this year about The Eddie Aikau Big Wave Invitational. The only information we have is that the contest organizers have secured a permit to run the iconic single-day big-wave event with the waiting period of Dec 15 – Feb 28. But a title sponsor hasn’t yet been announced, so it’s not clear whether the event will run or not! We’ll let you know if we get any more info on the event. Have a great trip! Hi again Jackie! We have some updates on The Eddie this year! The event has secured new sponsors so it’s ON–the contest will run if surf heights reach a consistent 20 feet between December 1, 2018, through February 28, 2019. The opening ceremony to kick-off the waiting period will be held Thursday, November 29 at 2:00 pm. We are planning on coming for the Volcom Pipe Pro in February 2019. I have read on many other sites that it was canceled because of permit problems, do you know if this is still happening or if it has been canceled. Hi Jen! 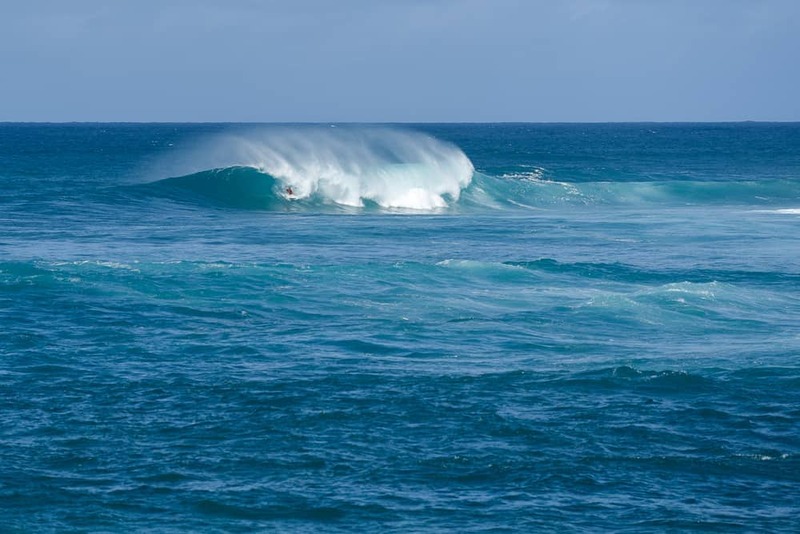 There was some back and forth with some permits in Oahu, but according to the WSL, the Volcom Pipe Pro is ON and will run Jan 29 – Feb. 10, 2019. Have an awesome trip! Hello, We will be in Oahu December 31 to January 6, are there any competition during this time? Hello, yeah, it’s possible to catch The Surf N Sea Haleiwa International Open at Haleiwa Ali’i Beach Park from 12/23 – 1/2 and/or the Da Hui Backdoor Shootout at Pipeline has run the first week in Jan in the past. Right now the dates are not available so you’ll have to check back early Dec or so. Enjoy! I would like to watch the 2019 Volcom pipe pro. If I was to book tickets do you have any idea on approximate dates? Hi Debby, The 2019 Volcom Pipe Pro will run between January 29 – February 10, 2019. Because surf competitions heavily depend on the surf conditions, organizers set a window for the contest to run and then choose the specific competition dates when they can see the forecast and determine which days are best to run the contest. I don’t know how long you’re planning to go, but we’d recommend planning your trip right in the middle of the contest window (Jan 29 – Feb 10) for the best chance at making sure the contest runs while you’re there. Have a great trip and happy travels! We are planning on going to Oahu from November 26 to December 10th. Is there any competitions going on? Never seen any competitions before and it’s on my bucket list. Which ones are the best ones to go to see the biggest waves? You’re going at the best time for surf competitions! You will be in Oahu for the Vans World Cup of Surfing at Sunset Beach (the window runs 11/25 – 12/6), and if you’re lucky with the right surf conditions, you might be able to catch the Billabong Pipe Masters (the window runs 12/8 – 12/20). You can read all about the events and more details in this article. 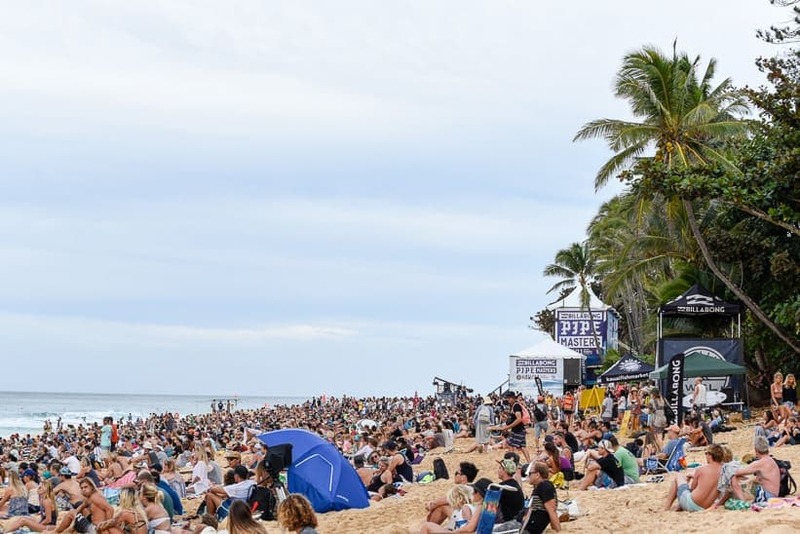 The competitions are all amazing to see, but the Billabong Pipe Masters is definitely the most impressive because there’s potential for the biggest waves and the waves break really close to the beach so it puts the audience super close to the action. Hi Brett, Thanks for your comment, I appreciate your feedback! We’re passionate about supporting female surfers and inspiring more women to get out there in the lineup. For this article, we hadn’t found any female surf competitions on the North Shore. We recently did some digging and found a women’s WSL QS event that happened at Pipeline in March (The Wahine Pipe Pro), so we’re going to add that to the article, but didn’t see any others. If you know of other women’s surf competitions on the North Shore please let us know and we would be more than happy to add them to this list. Cheers! I know it;s probably to late in the year but do you know of any competitions between 10-24 April? Any surf comps during the week of March 14-21 2018 ?? Not that we know of. 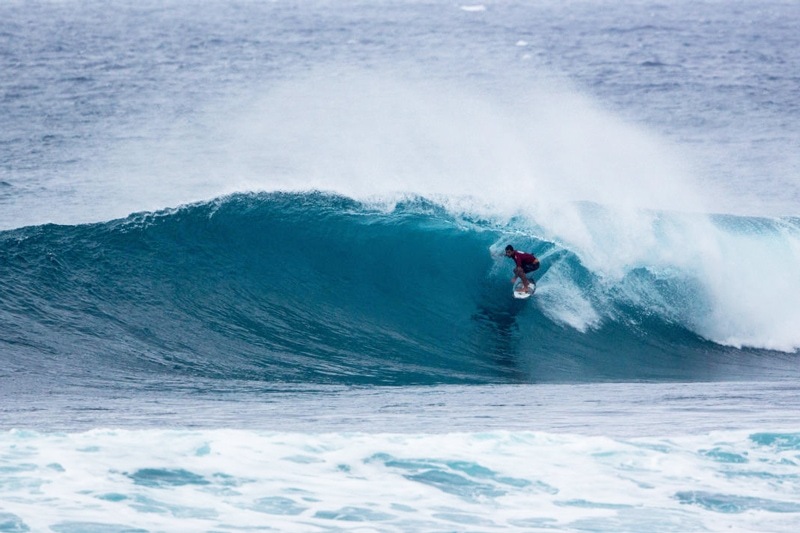 The next event close to those dates is the Pipe Pro Junior Mar 27 – Apr 03. Have a great trip! Any competitions on the north Shore this week? Is there any competition going on tomorrow or Wednesday on the north shore? Not that I’m aware of. The Volcom Pipe Pro just finished yesterday and the Sunset Pro Standup World Tour at Sunset doesn’t start til maybe Thursday. Will be on Oahu Feb 17-23 any north shore comps / events during that time? Kelly, for the North Shore, just the IBA GoPro Pipe Bodyboarding Challenge which starts on 2/19, and the Buffalo’s Big Board Surfing Classic on the West Side at Makaha. Hi Jenah, unfortunately, I’m not aware of any surf competitions going on during that time frame. However, there is the IBA GoPro Pipe Bodyboarding Challenge at Banzai Pipeline on the North Shore that might run within your window. Either way, as I’ve mentioned to some other folks, just witnessing the waves at Pipeline in real life is a spectacle if you haven’t experienced that before and definitely worth a visit. Enjoy! This is a nice page youve set up! i will be in Oahu and Kauai february 2-12, and it would be totally great if I can catch a comp(volcom pros?). Do you think you could help me with some info please- how can i get an update of the exact date for the comp? is there local transportation to there from lemon road waikiki? also, can you recommend a good surf school (1day)on Oahu? thanks alot!! Hi Jyo, thanks much! Glad you like our website. The thing about surf comps is that there is not a pre-established schedule. Everything is very spontaneous and dependent on the surf conditions. For exact dates, your best bet is to check https://www.worldsurfleague.com/events/2018/mqs and keep an eye on the Volcom Pipe Pro once we’re within the window of the competition. As for surf lessons, you should check out Surf N Sea in Haleiwa (https://www.surfnsea.com/en/). They’ll take good care of you. Regarding transportation from Waikiki, I’d recommend contacting your hotel or host as they’ll be better equipped to provide you with the most accurate information on local transportation to the North Shore. Thanks again and you’re very welcome! Have a great trip! We are really hoping to be there for the Volcom pipeline 2018 competition. We’d be renting a car. Do you have any tips for parking at the competition? We’ve never been to Hawaii. Hi Paul, the North Shore of Oahu is a very small mostly residential area. There is only one road, Kamehameha Highway (aka Kam Hwy), that goes along the coast where you’ll access all the different beaches and surf breaks including Pipeline. That being the case, there is not much for parking except in the main parking lot at Ehukai Beach Park and along Kam Hwy or in the residential neighborhoods. My advice is to get there if there is going to be a comp. Otherwise, park where you can and walk in. Best of luck! Aloha!will be any Bodysurfing contest in March / April 2018?Northshore lifeguards ???Mahalo. Aloha, I’m not sure and couldn’t find info about any. You’ll have to ask around. Good luck! Well, it depends on the swell and wind conditions. Generally, winds are lightest in the morning and get stronger during the day. If that’s the case, then around 6:30 – 11 am might be the best window. But that’s not always the case. On the North Shore, any light to moderate winds blowing from the east tends to provide the best conditions, and that can happen at any time of day. 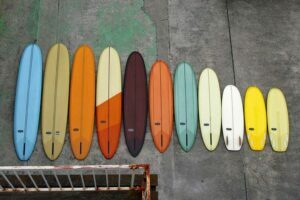 Hi, yeah, the Buffalo’s Big Board Surfing Classic (https://www.buffalosurfingclassic.com/) should take place during that time. It’s not your typical high-performance shortboard surf comp but it will still be fun and awesome to watch. However, that is not on the North Shore, it will be held on the West Side at Makaha Beach. As for the North Shore, there might be a bodyboarding competition going on during that timeframe called, IBA GoPro Pipe Bodyboarding Challenge. Enjoy! Do you know if the IBA was confirmed? I can’t find it on the IBA website. Hi, is there a website with the schedule for the Volcom Pipe Pro that we could look at to better plan a stop at the North Shore during our vacation? 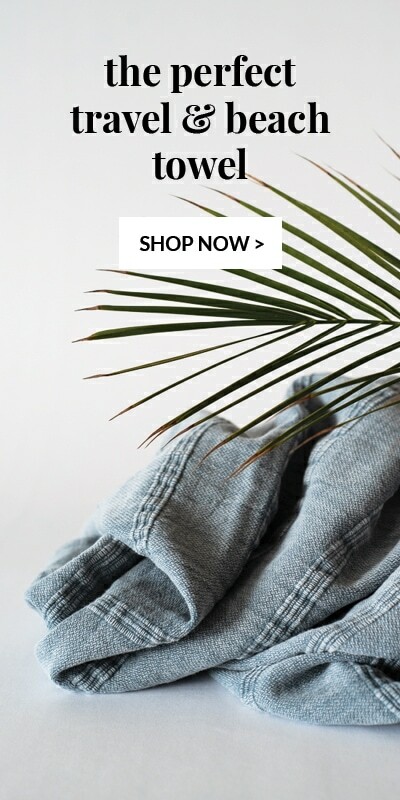 Hi Joanna, you might want to check back at WSL.com from time to time. Here is a link (https://www.worldsurfleague.com/events/2018/mqs/2609/volcom-pipe-pro) directly to the Volcom Pipe Pro event where they should update the schedule when they have more information. That’s the thing about surf competitions is they don’t know exactly when the contest will run until days before, sometimes the day of, so planning and updates can be very spontaneous. Hope that helps! We are going to be in Oahu Jan 7-12. Are there any surfing competitions going on those days? Hi Carrie, there should be! The Da Hui Backdoor Shootout might be going the 11th and/or 12th. I’d suggest checking Pipeline on either of those days regardless of there being a contest on as the surf should be big and good! Enjoy! We are coming to the North Shore on Jan 1 to Jan 5. Are there any surfing competitions going on that week? Actually, turns out the Da Hui Backdoor Shootout window is Jan 4 – Jan 16. So they’ll look to run the contest on the best 3-4 days of surf conditions during that time frame. I glanced at the surf forecast and it looks like some pretty decent conditions might be available on Jan 4th, so it’s possible that they will run some heats that day! It will be best in the morning. Looks like that is your only chance to catch a surf comp. However, there will probably be some solid waves on the 2nd and 3rd too, so while there won’t be a contest going on, there will certainly be lots of pros in the lineup warming up for the comp which is always fun to watch. Enjoy! HI Eric, We will be in Oahu on Jan 23 with a cruise. Are there any Surfing competitions going on on Jan 23? Or should we be likely to see some gnarly surfers at Waimea Bay on that date? Hi EJ! Good stuff, it’s possible that the Sunset Pro Junior could be going on. The window for the contest is from Jan 18 – 28, 2018, so, if the conditions are good enough on Jan 23 when you’re there, it’s possible that it could be on. If not, just watching free surfers anywhere on the North Shore is always a good time if the waves are solid. But I’d recommend checking out Banzai Pipeline because it’s one of the best places in the world to watch waves. Waimea is amazing too, but it has to be HUGE to break. A week before you go, check the surf forecast here to see how big and good it will be. My husband and I will be traveling to Oahu in 2018 during the Volcom Pipe Pro. 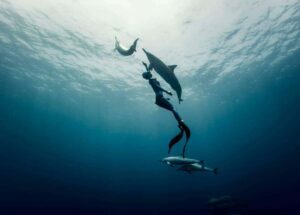 Do the competitors ever do “meet-and- greets?” I know my husband would love an opportunity to meet some of the surfers and it would be a cool surprise for him as he will be celebrating a milestone birthday while we are there. Any info is greatly appreciated! Hi Mary, good question, I’m not sure about that. But I just emailed Red Bull and I’ll let you know what I find out once I hear back! Cheers! Hey, Eric! Thank you so much. I really appreciate you looking into that for me. I will stay tuned! Hi Mary, well the verdict is that they don’t really ever organize meet and greets that would give you the chance to mix and mingle with the pros. However, sometimes sponsors will put on PR/marketing events that might involve the opportunity to meet that brand’s riders. You might want to just try swinging by the Volcom house and striking up a conversation with the crew. Good luck and have fun! I love love love watching surfing. I feel fairly informed about how the wsl tour works but I am still puzzled about who qualifies to enter the events tat make up the Triple Crown. Can you explain this for me? Hi Christine, yeah, we could get carried away binge-watching a good surf competition for hours! The qualification process is not a perfect science and even seems a bit obscure, probably intended to leave the WSL and their partners some flexibility. My understanding is that the WSL Commissioner’s Office and the Event licensee select the surfers based on a detailed list of eligibility rules and guidelines. One criterion they have for Hawaiian QS events is that the event will include at least 16 local Hawaiian surfers. I’m sure there is a lot to it and the top-ranked surfers in the world have priority but it appears that a surfer can “qualify” to enter a Vans Triple Crown event simply by being a local ripper with a good reputation and a nomination from a trusted source. On that note, the competitive surf scene in Hawaii and throughout the world is a very tight-knit community. These guys and girls start early and know each other from a young age. So when it comes time to enter an event like the Vans Triple Crown of Surfing, I’m sure the WSL and local Licensee already have their fair share of professional surfers to choose from. You can download the WSL Rulebook from their website and read more about their selections process under Article 45. Hope this helps!